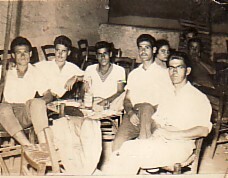 Above: At Salanis' kafeneio, Lagada, Mytilene. L-R: myself, Konstantinos Kariglas, Dimitrios Liris, Nikolaos Loulousides and Georgios. 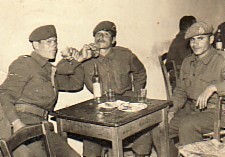 Above Right: National Service- with Mihalis (from Petra) and Christos (from Asomatos). I am on the left. Above: With Emmanouil Pitalias (right). 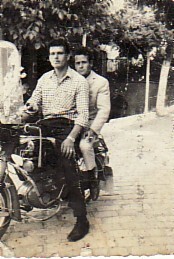 We are off to pick up materials for work- on my Floretta motorcycle.